The results of the short survey are in. More of you asked for a new story with new characters. Almost as many wanted Emily and Hilda, so they will be back. Meanwhile, enjoy Days of Lead (© 2018 JT Hine). Joe Mather felt and heard a heavy thump up ahead as he coasted downhill. It pushed the hot September air into his face like a gust of wind. He sped past the heavy traffic that choked downtown Rome during the lunch hour, even on the weekend. Ahead on his left stood the American Embassy, still called Palazzo Margherita by the locals. Wondering about the noise, he decided not to stop at the Embassy Annex to his right, where he had been going. He negotiated his way across the oncoming and left-turn traffic to pass in front of the Embassy. When the smooth asphalt of the Via Veneto turned into the bone-jarring cobblestones of the Via Bissolati, he recognized the smell of burning oil. He expected to see a stalled car blocking the street with smoke pouring from its engine. But the traffic still moved, past the international airline offices that lined both sides of the street. The sun reflected off the walls and windows of the tall buildings, adding to the hot air and the oppressive, oily feel of the smoke. Traffic began to back up. The wail of sirens came up behind him. The cars moved to the right. He pulled his bicycle over and put a foot on the sidewalk to watch two police cars and a fire truck go by. They rounded the bend ahead, and he could hear them stop. Joe dismounted and began pushing his bicycle on the sidewalk. Up ahead, the firemen hauled out hoses across the street, while the police started funneling the bumper-to-bumper traffic into Via San Basilio and Via Carducci, the two side streets on either end of the scene. Black smoke billowed from a burning car and flames licked the front of the Pan American Airlines building. The windows of the ticket office gaped like monstrous mouths. Glass and debris lay everywhere – and two bodies. Joe had never seen a dead person before. A young woman lay up against the building, her body making an unnatural right-angle bend from the sidewalk up the wall. Her hand still clutched the shopping bag smashed against the wall. Joe’s stomach quivered. The blackened corpse had no face. The other body was only legs, sticking out of the window of the ticket office. The rest of him was inside. Fresh blood ran down the side of the building. Joe froze. He felt as if he were there alone, looking from outside himself. The firemen moved quickly to spray water and foam on the burning car and the building. Ambulances and more police cars arrived. “Dietro, ragazzo!” Back, boy! A rough hand on his arm snapped Joe back to reality. A cordon of police was shoving him and the gathering crowd back up the Via Bissolati. Joe mounted his bike and pedaled into the stalled traffic, back toward the American Embassy. He didn’t make it. His stomach gave him just enough warning to pull into the side street that went behind the Embassy, jump off his bicycle, and duck behind the overhang of the large fountain on the corner. He threw up and held himself up against the wall until the shivering stopped. The mess ran through a grate into the sewer below. Joe cleaned himself up at the fountain and rinsed his mouth. After a long drink of cold water, he waited for his pulse to settle. Even on the hottest days, the greenery hanging over the wall of the Embassy created a cool corner next to the fountain. The spring blooms had long since fallen, but the plants hanging over the wall had a sweet smell in this pocket of sanity and peace. Joe could not linger. He had to return some books to the US Information Service library in the Embassy Annex and look for a book about Admiral Farragut for a history report. He rode back up the Via Veneto to the Embassy Annex. The Annex occupied a 17th Century palazzo between two luxury hotels. The entrance had a Stars & Stripes newsstand and mini-bookstore on the left, with the entrance to the USIS Library on the right. Directly ahead, a set of swinging doors led into the main lobby, where the Army Post Office service counter was. Most of the offices in the Annex were occupied by military personnel and civilians working for the Military Advisory Assistance Group, which had been overseeing the Marshall Plan. By now Europe had essentially recovered from World War II, but the massive organization that had rebuilt Western Europe in less than 15 years was still winding down. Many American agencies that were not the usual Embassy staff had liaison offices in the Annex, such as the FBI, the Department of Agriculture, and the Coast Guard. The cool air inside the doorway reminded him sharply how hot it was outside. As he was about to turn right, he noticed a young woman with her arms filled with newspapers and books trying to open the door from the Stars & Stripes shop. He reached over and held the door for her. “Thanks,” she said, with a smile that reached her blue eyes. “I really should remember to do this in different trips.” Obviously American, with her blond hair in the bouffant style, she wore a light blue cotton blouse and a beige skirt. Joe walked over to the heavy swinging doors to the main lobby and held one out of her way. “You, too.” She paused, smiled again, then smoothly moved through the door towards the grand staircase on the left. Joe had held countless doors for women, so why did this one make him hold his breath? He let out a silent sigh and stepped down into the Library. The USIS Library was probably the size of a small-town library in the US. He wasn’t sure about that, never having lived in a small town. The walls of the large circular room were lined with dark wooden shelves. Smaller, free-standing shelves shared the floor with couches and reading desks. Long windows at ground level covered the upper half of one wall, allowing in the light. The library patrons could watch the waists and legs of the pedestrians on the broad sidewalk outside. The card catalog and the librarian’s station occupied a circular fortress of wood and marble in the center of the room. He found what he was looking for and sat at one of the tables to examine the book. Remembering the images and the smells of the car bombing made concentration impossible. He decided to check out the book and go home instead of working at the library. Soon he was riding down the smooth open roads that crossed the Villa Borghese gardens and led to the Piazzale Flaminio. What used to be the assembly point for triumphal marches by the Roman Legions was now a traffic madhouse, where busses from several different lines met the trolleys, and passengers ran among them. Romans hoped to have a subway station there someday. 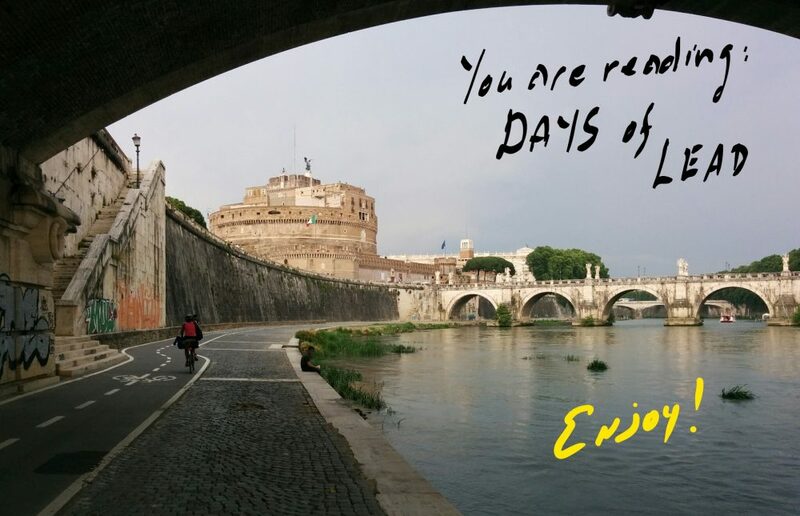 Joe took back streets to the Lungotevere delle Navi, then upstream to the Risorgimento bridge over the Tiber River. A quick ride along the shady Viale Mazzini brought him to the foot of the Monte Mario hill overlooking the city and the sweaty climb home. Joe looked up from the couch, where he was taking notes with a copy of Damn the Torpedoes, Full Speed Ahead: The Story of Admiral David Farragut on his lap. “Who did it?” he asked. “They still don’t know, but a neo-fascist group threatened something like this yesterday. Did you see this picture?” she asked, turning the paper around to show him a photo on the front page. It was the young woman with the shopping bag. Joe nodded. He looked back at his book. His mother did not need to know just how close he had gotten to the blast. Angela, their housekeeper-cook, kept the small refrigerator stocked for the weekend. Nancy was a good cook, but Joe and she also enjoyed these walks to the tree-lined Piazzale delle Medaglie D’Oro at the top of the Monte Mario. Sometimes they would walk to the Parco della Vittoria next to the piazzale, with its stunning view of the Eternal City. Nancy Mather was tall for a woman, with the grace and form of a championship tennis player, which she had been. Joe was taller than she. She had rich, auburn hair, while his was sandy-colored like his father’s, but they both had bright hazel eyes with long lashes, and similar nose and mouth. People often mistook them for siblings, rather than mother and son. It was dark and cool by the time they reached their favorite rosticceria . Pointing to the food under the display window, Nancy picked the roast chicken with roast potatoes; Joe asked for sliced porchetta , the special Roman roast pork with rosemary and other herbs, also with roast potatoes. They took their trays to one of the Formica-topped tables in the brightly-lit room. Back home less than an hour later, Nancy went into her study to work. Joe sat at the dining room table finishing up the history report. Joe dreamed about the bomb blast, but the body in his dream was that of his father. His own screaming penetrated his sleep. The scene cleared until he found himself looking up at his mother’s terrified face. She was shaking him awake. Joe could not answer at first. His bed linens and pajamas were soaked with sweat. He began shivering. Nancy Mather hugged her son, dampening her own nightgown. They stayed like that with only the lights from the street coming in the windows while they regained their composure. A late-night bus slowed with squealing brakes outside, making the turn to go down the hill. They remade the bed together in silence. “Want some hot chocolate?” she asked when they had tidied up. “Sure.” Joe slipped into the dry pajamas, then followed his mother to the kitchen. She had put a kettle of water on. When she turned around, Joe saw the tears running down her face. “Mom, what’s wrong?’ He crossed the kitchen and hugged her. Joe fought back the lump in his throat. “Yes, and you always left the sticky things in the car.” She laughed in spite of the tears. “He never figured out that I didn’t like them.” Joe chuckled, grateful for the distraction. The kettle whistled. Joe went to the stove with the cocoa while Nancy got out the cups. She found some cookies and set them out. They sat across from each other at the kitchen table. The hot chocolate felt good. “I don’t like remembering Dad that way, but I wouldn’t have wanted to sit at home. I know he wanted me there.” He forced himself to remember his father as the strong, handsome man he had been, not the shriveled skeleton he became, wasting away in the VA Hospital in Richmond, Virginia. No one ever figured out what caused his body to break down. “Nights like this, I’m not so sure,” she said. She reached across and squeezed his hand. Back in bed, Joe realized that his mother had not looked for her cigarettes the whole time they were up. Six thousand miles away, Siegfried Kanter stubbed out his cigarette in the marble ashtray on the table. “Does anyone have a better idea?” He looked around the room. His company’s security people had swept the whole suite in the Waldorf-Astoria, or he would not be having this conversation. His expression was severe, but, then, it usually was. “Not really, Sig.” This from the Texan with his booted feet stretched beneath the coffee table. His sunburnt face set off his white hair dramatically. The tallest man in the room, his lanky frame betrayed his origins in the oilfields of West Texas long ago, as did the bolo tie held by a silver slide. Sandro was a slightly plump man, the only one of the four whose hair was thinning. Like them, he wore a custom-tailored suit and shoes. “It should work just fine, Ettore. The people in my office here have worked with him for years. He understands no Italian at all and is unlikely to notice anything not in English in the files he forwards to New York.” He played with the Montblanc pen that his wife had given him. Silence reigned as Siegfried looked around again. “Are the Carabinieri buying shares, too?” said the Texan, with a grin. The others smiled. They knew that Ettore Arcibaldo was the point man for this initiative, and the only one likely to be exposed if the operation failed. The General’s smile did not extend to his eyes. “Hey, we might cover our costs with this!” the Texan laughed at his own joke. They all rose and shook hands. By prior agreement, they left the suite two minutes apart, and did not gather for dinner. On Monday morning, each was back in his office, having gone to New York for a “shopping trip over the weekend”. The General was in a public meeting in Rome with his political supporters. That same evening, Officer O’Toole stopped at the corner outside the United Nations building and turned back. The black Ford Fairlane with diplomatic plates had been parked in that spot all day yesterday. He shone his flashlight inside, but the car was empty and clean. He turned to his radio. O’Toole paced next to the car. The heat from the day was radiating back from the asphalt and concrete, making him sweat. He hoped that he could clock off on time tonight. Ten minutes later, a black sedan with dark windows pulled up behind the Ford. A tall man in a business suit got out and approached O’Toole. He held out his credentials. US Secret Service. Ashford nodded as he returned to his car. He pulled out the microphone to his radio and called in the plate number to his office. In less than two minutes, he had his answer. He waved to O’Toole. Manny Romero pulled his tow truck into the NYPD Impound Lot with a wave from the guard at the gate. With the smooth grace of years of practice, he pulled to the last place at the end of a row, lining the Ford Fairlane up with the rest of the cars. He lowered the sedan, unhitched it and drove the truck to the garage, where he parked it for the night and walked home. Special Agent Ashford reported the suspicious car to the FBI, and sent a request to ATF (Alcohol, Tobacco and Firearms) to have the car checked as soon as possible. Then he closed his office and went home to try to get some sleep before he had to meet the Italian delegation coming from Rome. At 10 a.m. the next morning, the President of Italy arrived outside the UN with an escorted motorcade, the third of a dozen European leaders who would arrive in the course of the day. At 10 a.m., New York Fire Department responded to a call from the NYPD Impound Lot. The explosion at the end of the latest row of cars destroyed five vehicles and blew a hole in the fence. Three civilians in the street outside were injured by flying pieces of fencing. The newspapers ran the story on page six the next day, the front page being full of pictures of heads of state arriving for the General Assembly of the United Nations. Hello, my dear Jon….First of all…I like this new story line very much…but I shall miss Emily and Hilda’s adventures…so, while enjoying this new line I will look forward to “seeing” Hilda & Emma later on. When did you post the survey? I missed it somehow. Hope you are doing well and enjoying some decent weather, wherever you are at present. It was very beautiful here on the farm today…I took my 3 dogs (and my cat, Mr. Boots) out for a walk in the fields this afternoon and just enjoyed the peace and quiet for about an hour. Thank you, Jan. The survey is at the end of the last three posts. Any one will do.